TMJ- this stands for Tempero-mandibular joint. This joint is just in front of your ear and connects your lower jaw to your upper jaw and is the most complex joint in the body. I believe that it should also stand for Teeth, Muscles, Joint as these structures are interdependent. In some people, closing the teeth together can cause their jaw joints to displace. Over a period of time this can either cause their joints to click, tooth wear or sore muscles (leading to headaches) or all three! You may not have any symptoms but early signs of TMJ problems can be picked up during a dental examination before a problem arises- remember that prevention is better than cure! If you are concerned about any of these issues then we can help. Save money on your shopping with a Free Countdown Card* when you join Denplan! If you sign up to Denplan during September you can receive a Countdown Card (worth £49.95). With this you can access thousands of great offers and discounts to help you save money on local shops and restaurants as well as top high street and online retailers. Study suggests that regular check ups reduce major tooth loss. Regular exams are an important element of preventative dental care. A Swedish study published this year showed that long-term routine dental attendance throughout middle and early older age reduced major tooth loss across time supporting the principle of encouraging routine dental checkups. Tooth decay and gum disease are two of the commonest, but preventable diseases known to man. Regular and effective toothbrushing play an important role in the prevention of these diseases. A recent review of clinical studies has shown that electric toothbrushes reduce plaque and gingivitis more than manual toothbrushing in the short and long term. At Harrogate Spa Dental we normally recommend electric toothbrushes by Oral B.
It’s possible to get an amazing smile without having your teeth filed or shaped! 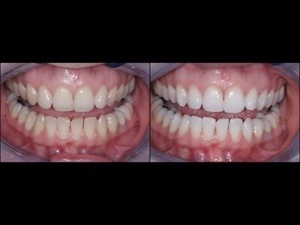 If your teeth are slightly crooked then they can be straightened in 6 months or less. Once they’re straight they can be whitened and and the appearance of any uneven tooth edges further improved by bonding tooth coloured filling. Patients are far happier as the treatment is more affordable and less risky for their teeth. When you join Denplan in May or June there is no registration fee! An easier way to budget for your dental care. A range of affordable payment plans from as little as £10.85 a month. Avoid unexpected dental bills and join denplan today online or phone the reception team and we can join you online! Fluoride varnish helps to reduce dental decay! Research shows that application of a fluoride varnish to teeth twice yearly can reduce decay by 40%. At Harrogate Spa Dental we routinely apply fluoride varnish to adult and children’s teeth with no charge! 1 Pre-clinical interview: so that you can tell us if you have any concerns. 2 Muscle evaluation: so that we can evaluate your jaw muscles and joints and relate any findings to what we find in the mouth. 3 Joint evaluation: to check jaw joint health. 4 Soft tissue evaluation: to see if the soft lining of your mouth is healthy. 5 Radiographic exam: to check bone levels around teeth and to see if there is any decay between your teeth. 6 Existing Teeth and Conditions: to check existing fillings and see if there is any decay. 7 Occlusal examination: to check how your teeth bite together. 8 Periodontal examination: to check the seal between your teeth and gums. Your smile is important so make an impression by whitening your teeth! Migraines, morning or afternoon headaches? We may be able to help! Involuntary tooth clenching or grinding can cause these symptoms as well as causing damage to your jaw joint (it might click) and teeth. A simple occlusal appliance can help in reducing your symptoms so that you can enjoy your life again. Please contact us on 540879 or info@spadentalcare.co.uk if you wish to know more!